On October 11, Consul General Hong Lei met with U.S. Congressman Mike Quigley in Chicago. Consul General Hong Lei said that China and Illinois are maintaining close friendly exchanges and cooperation. China has become Illinois' second largest trading partner and third largest export market. Chinese companies invested a total of $4.2 billion in Illinois and there are more than 17,000 Chinese students studying in Illinois universities. The fruitful sub-national cooperation is a concrete manifestation of the development of China-U.S. relations. As the world's top two economies, China and the U.S. share broad common interests and should cooperate in more areas. 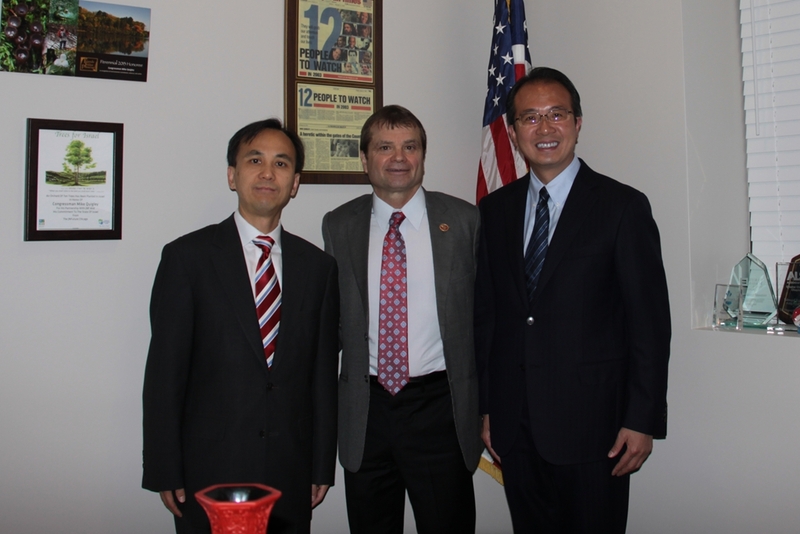 The Chinese side hopes that Congressman Quigley could continue to support the State of Illinois to deepen its cooperation with China and actively promote the development China-U.S. relations. Congressman Quigley happily recalled his visit to China in 2014 and said that win-win cooperation between the U.S. and China in economy and trade is an important foundation for the development of bilateral relations. The leaders of the two countries have reached important consensus on climate change and other global issues, which is conducive for both sides to conducting better cooperation. He looks forward to greater development of U.S.-China relations.